I read Masters of Doom a few weeks ago, and it inspired me to do some old-school DOS VGA graphics programming. When I was a kid I played around with some sample programs that came with DJGPP or Borland C or Turbo Pascal that did various interesting things with VGA graphics, but beyond modifying the routines slightly to see the effects I never truly understood what exactly was happening. 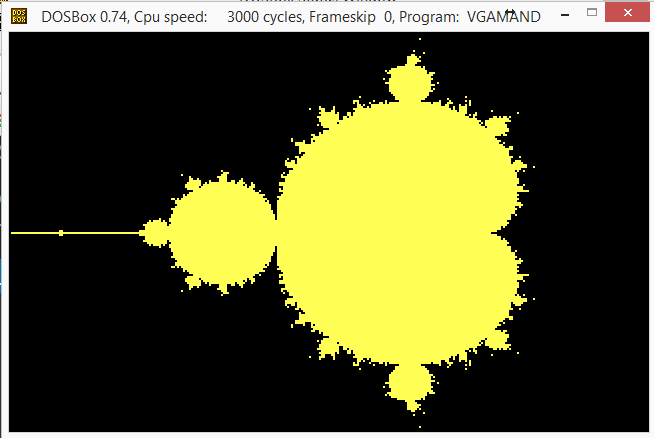 There’s a fantastic VGA programming tutorial here: http://www.brackeen.com/vga/. Big thanks to David Brackeen for writing that. Unfortunately there are not a lot of good DOS programming resources that are easily searchable. I’d really like to figure out how to read keypresses. David’s tutorial covers registering mouse activity, but I can’t find anything for the keyboard.